New date for the battle between Belarusian giant Alexander Ustinov (28-1, 21 KOs) and the renowned Samoan veteran David Tua (52-4-2, 43 KOs ) is officially confirmed. Tua vs Ustinov will be held on November 16 in Hamilton, New Zealand. The initial meeting was set back in August, but the fight was postponed due to a Tua injury. “After the cancellation I went back to my usual training in Minsk. I had more time to even better prepare for my opponent. Now I have even more confidence and I am ready for a meeting with Tua,” – said Alexander Ustinov. “Yesterday our partners from Duco Events have sent us a medical conclusion that David Tua is fully recovered from the injury. Thus, there is no doubt that the fight will take place on November 16 in New Zealand. This will be a battle of two heavyweights that have different physical characteristics, mental abilities, technics, and lives in different parts of the Earth. 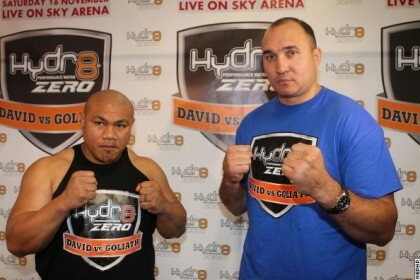 Ustinov spent 3 weeks in New Zealand in August, sparred and engaged in promotion of the fight. During this time he has gained a lot of fans who are looking forward to this fight. We will make everything possible to broadcast Ustinov vs Tua fight live for the boxing fans in Ukraine and Russia,”- said Ustinov promoter from K2 Promotions Alexander Krassyuk. Next boxing news: Marquez vs. Bradley: Will Juan Manuel’s “Dinamita” be potent enough to put a dent in Mt.Timmy’s forehead?